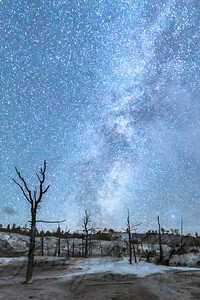 Grand Teton National Park, Wyoming This composite shot of the Milky Way over the Grand Teton Mountains in Wyoming is made up of 20 images manually stitched together creating a full view of our galaxy as seen in the Northern Hemisphere. Take a closer look to find the five shooting stars in the image. The colors in the shot are reminiscent of the Aurora Borealis but are not. The turquois and blue are created by the gases and light in the atmosphere. 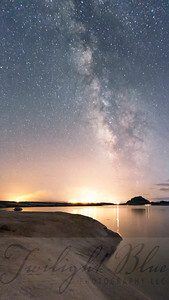 Warm Creek Bay, Lake Powell, Utah In September, close to a new moon over Lake Powell made for a spectacular night sky show of the Milky Way. 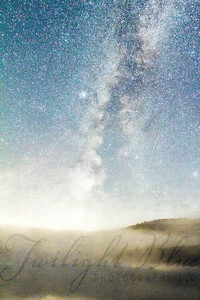 Moss Lake, New York I spent several days working with the night sky in the Adirondack mountains in mid-August. 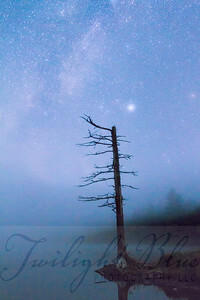 This lone tree against the Milky Way was shot about 3 a.m. in dense fog. The two lights to the right of the tree are the planets Jupiter and Venus at their closest point of the summer. 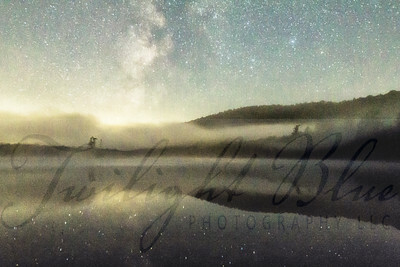 The dense fog wasn't enough to hide the Milky Way shining at its prime on an August night over Moss Lake in the Adirondack Mountains. Although I couldn't see anything through my viewfinder, the camera saw everything. Moss Lake, New York The fog was so dense and the sky was so dark over Moss Lake in the Adirondack Mountains on this particular evening that it made it impossible to set up shots as I would normally do. So, since there was snot way to compose the shot in the camera, I made several attempts' to capture and image where I just put the camera down, released the shutter and hoped for the best. Cookie Jar Canyon, Lake Powell, Utah For a month this fall I had the opportunity to travel to many of our national parks out west. 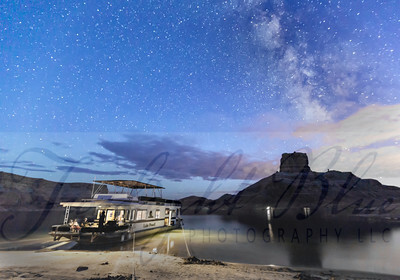 I was fortunate enough to spend five days on a house boat on Lake Powell. Each night we would dock our home away form home in a different location. 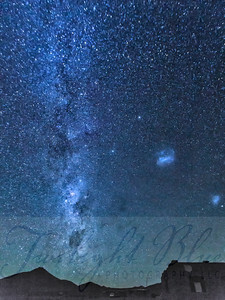 Here is a shot early in the evening of our house boat in Cookie Jar Canyon with the Milky Way over head. It was heavenly! Yellowstone National Park, Wyoming Mammoth Hot Springs is a mountain of white mineral deposits that have built up for thousands of years. Dead trees dot the landscape creating an eerie quality. 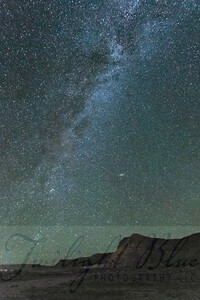 I chose to photograph the landscape on a moonlit night. In spite of the light from the moon, the stars burst from the heavens with power. Grand Teton national park, Wyoming The Grand Teton national Park provides incredible scenes of landscapes and wildlife throughout the park. The Mormon Row Historic District provides a glimpse of how people used to live in the area. 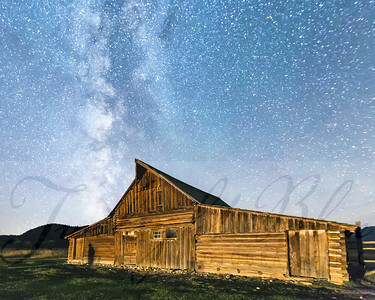 This is a shot of one of the barns on a clear night during a new moon. The wonderful colors of the night sky provide a beautiful backdrop of the architecture. Yellowstone National Park, Wyooming The Old Faithful Geyser in Yellowstone National Park erupts approximately every 90 minutes and is the center piece of the park. 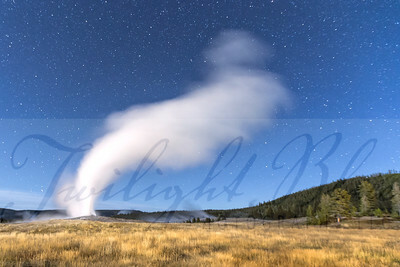 Here it is captured against the moonlit sky around midnight. The stars peak from behind the fountain of mist giving the only indication this is a night time shot. 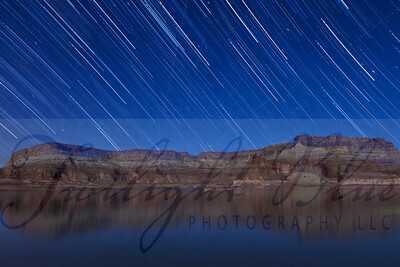 Gun Sight Canyon, Lake Powell, Utah When creating star trail images, the direction in which you point your camera will determine how the lines or star trails will be created. In this case diagonal lines formed in the eastern sky. the lines emulating from center are from airplanes taking flight throughout the night. The color of the rocks, the blue sky and the white star trails made me feel a bit patriotic. 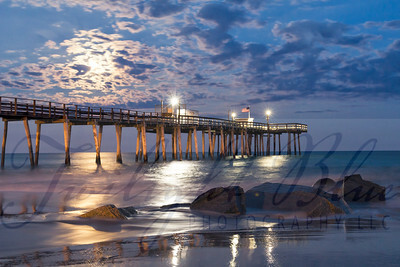 Margate Fishing Pier, Margate, New Jersey This was the first of three super moons which appeared in 2014. 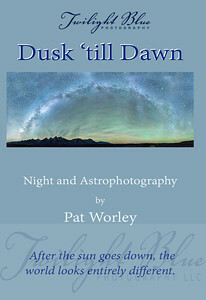 This image captured at twilight illustrated the magic of moonlight punctuated by a mackerel sky. 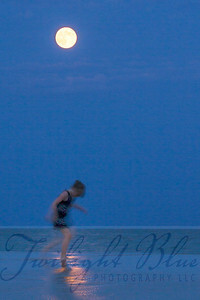 Margate, New Jersey I just loved how this little girl looked as she danced in the light of the Super Moon this summer in Margate. Although the moon is high in the sky at this point, it still shined brightly for everyone to enjoy. 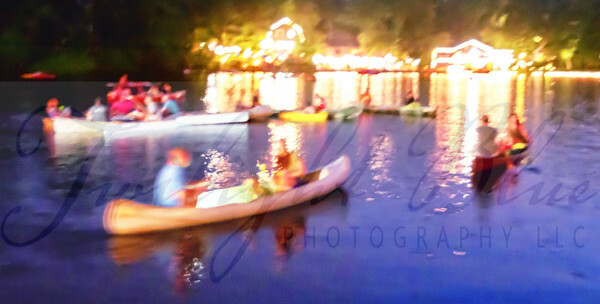 2013 Canoe Carnival Lower Aetna Lakes, Medford Lakes, New Jersey The flare goes off at twilight signifying the start of another Canoe Carnival. 2013 marked the 83rd anniversary of this spectacular parade on water. 2013 Canoe Carnival Mardi Gras Lower Aetna Lake, Medford Lakes, New Jersey Music and laughter can be heard across the lake as hundreds of friends and neighbors gather on Lower Aetna during Mardi Gras the night before Canoe Carnival each year. 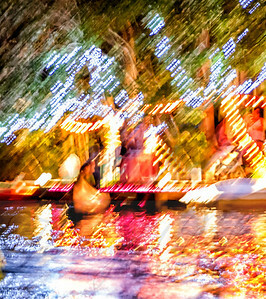 2013 Canoe Carnival Mardi Gras Lower Aetna Lake, Medford Lakes, New Jersey Light, color and sound overwhelm the senses on Mardi Gras Night in Medford Lakes. The stars truly have to align to get a shot of a rainbow over Geno's Steaks in South Philly. Twilight was setting in and a storm was in the distance creating this visual metaphor of a Pot 'O Gold. 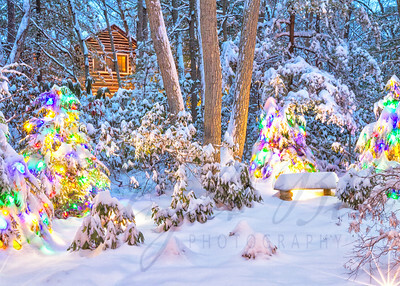 Macosa Trail, Medford Lakes, New Jersey Colored lights at twilight, snow covered pine trees and a log cabin in the distance epitomizes the beauty and charm of Medford Lakes. Beach Four, Medford Lakes, New Jersey The island at Beach Four is a unique feature in Medford Lakes. 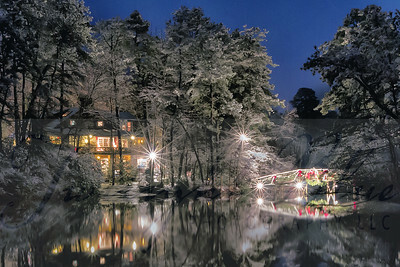 The Worley family decorations the bridge each year at Christmas time contributing to the charm of the community. Vaughan Hall, Medford Lakes, New Jersey The Medford Lakes community center, Vaughan Hall went through a restoration project in 2013. 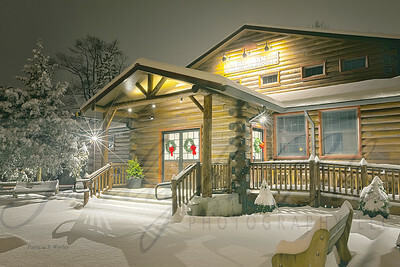 Here we see it after a beautiful snow storm in its new wrappings ready for the holidays. 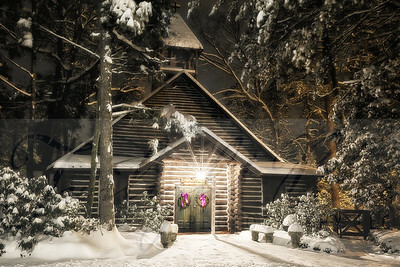 Protestant Community Church, Medford Lakes, New Jersey The Protestant Community Church, also known as the Cathedral of the Woods, is a beautiful log cabin structure dedicated in 1931. PCC is a vibrant nondenominational church serving Medford Lakes and the surrounding communities. 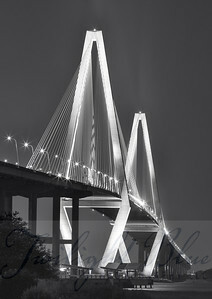 Charleston, South Carolina The beautiful architecture of the Arthur Ravenal Bridge punctuates the skyline of Charleston at night as you drive through the city. 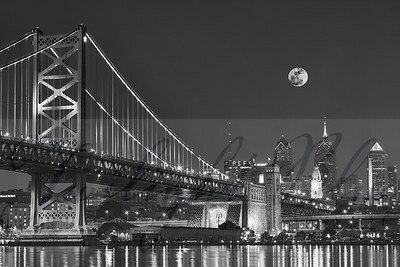 Ben Franklin Bridge, Philadelphia, Pennsylvania This image of the Ben Franklin Bridge and Philadelphia skyline is one of 25 photographs selected to hang in the new construction of the Pavilion for Advanced Care at Penn Presbyterian Medical Center opening in February 2015. 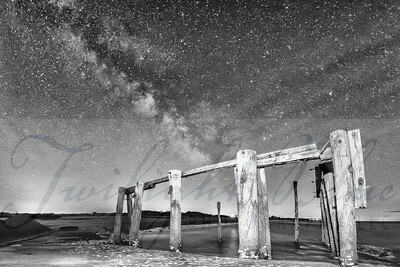 The images selected will be in the permanent collection and enlarged up to 9' x 9'. If you happen to be there, keep an eye out for it! I'm sure it will be hard to miss. 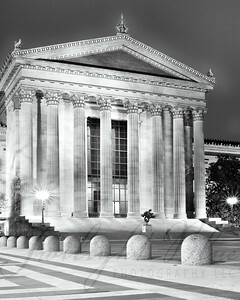 Philadelphia, Pennsylvania Climb the steps to the Philadelphia Art Museum and you will be welcomed by a spectacular Greek Revival entrance with eight pillars towering over 50 feet tall. 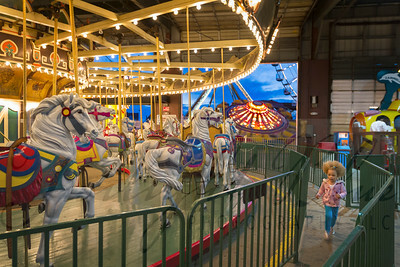 Once you arrive at the top, turn and look behind to experience a wonderful view of the Philly skyline. Although this image depicts quiet and solitude, the Art Museum steps are full of life and activity all year round. This night time image of the front entrance of the art museum hangs in the permanent collection of the Pavilion for Advanced Care at Penn Presbyterian Medical Center. Philadelphia, Pennsylvania The Fairmount Water Works and Boathouse Row are iconic Philadelphia landmarks located on the east side of the Schuylkill River just north of the Philadelphia Art Museum. 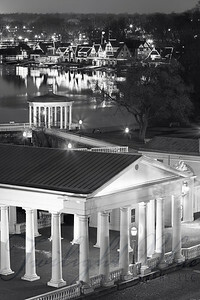 This evening shot taken from the back of the art museum depicts the Classical Revival architecture of the Water Works and the gingerbread style lighting of the club houses situated along Kelly Drive. When creating star trail images, the direction in which you point your camera will determine how the lines or star trails will be created. In this case diagonal lines formed in the eastern sky. the lines emulating from center are from airplanes taking flight throughout the night. The color of the rocks, the blue sky and the white star trails made me feel a bit patriotic.